Home / Sharpening Articles / Hunting and Outdoors / What sharpener can I use on hunting knives? 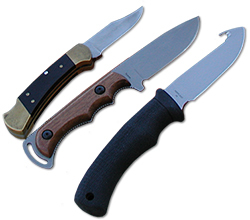 What sharpener can I use on hunting knives? I want to use an electric sharpener but I've tried a few and they don't fit my thicker knives. Many electric sharpeners designed for kitchen cutlery don't work on thicker blades found on hunting knives. We have great success with the Ken Onion Edition Knife Sharpener by Work Sharp. This sharpener was designed with the sportsman in mind. It is also very versatile. It can sharpen the thickest hunting knife but also sharpens fillet knives, small pocket knives, fine kitchen cutlery and even scissors. Questions on sharpening hunting knives?